Digi International has introduced a new surface mount radio communication module with next-gen interference blocking for noisy wireless environments. New Digi XBee SX 868 is deployable in several regions throughout the world and comes with pre-certification for EU countries. The module offers extremely reliable long-range, low-data rate connectivity for industrial IoT applications such as agriculture, heavy equipment, transportation, and energy/utilities. The compact SMT module, measuring about (22 x 340) mm, operates in the 863 - 870 MHz frequency band (K, L, M, N, Q/R) and combines tuned Surface Acoustic Wave (SAW) filtering as well as intelligent Listen Before Talk / Adaptive Frequency Agility (LBT/AFA) technology to avoid connectivity issues caused by external radio interference. The patented frequency scan occurs automatically without performance impact by listening to the radio environment before any transmission starts, automatically shifting to a new channel when an interference source is detected. The XBee SX 868 offers software-selectable data rates up to 80 Kbps, strong 128-bit AES encryption for data privacy, point-to-point and point-to-multipoint communication, repeater mode, and the patented DigiMesh protocol option with advanced networking features such as self-healing network configurations, sleeping routers, and high-density mesh network configurations. DigiMesh also allows nodes to both route data and enter low-power states, optimizing the power profile of the entire mesh network. This radio module provides sub 2 µA sleep modes, excellent receive sensitivity and exceptional performance with a theoretical line-of-sight range of up to 14.5 km using standard antennas. Its advanced immunity in challenging wireless environments, including problematic interference issues caused by public cellular networks, makes it the ideal choice for industrial IoT applications demanding reliable communication at all times. 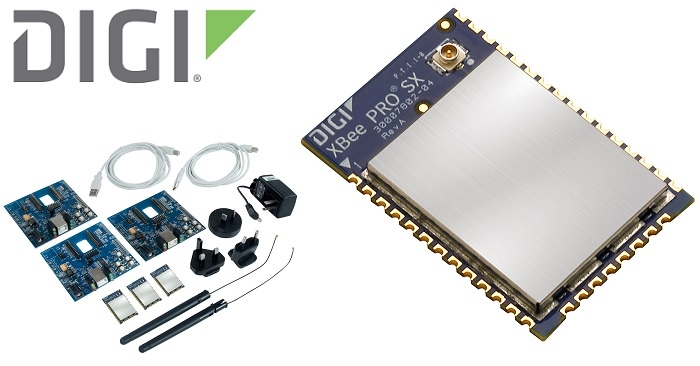 The Digi XBee SX 868 module is now available for purchase through Digi’s global network of authorized distributors for $19.51 (MSRP) in 1k volume quantities. The module is available in a variant containing an on-module standard U.FL antenna connector, as well as a variant containing a surface mount antenna pad for high-vibration or customized applications. Development kits are available for $199 (MSRP).